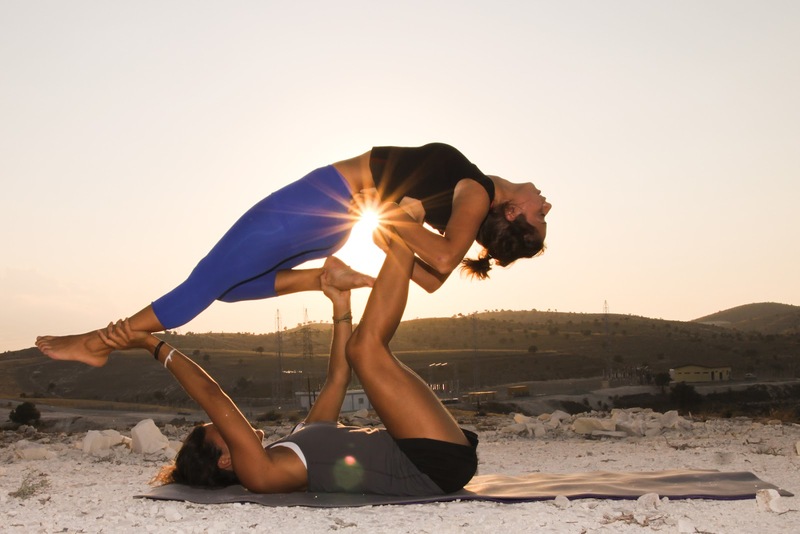 Have your friends invited you along to an Acroyoga session yet? If not, expect an excited phone call or text soon. The Acroyoga trend, which blends yoga and acrobatics, began heating up a few years ago. Currently, studios all over the country employ instructors trained in Acroyoga, and it’s fair to say we’re in the midst of a full-blown Acroyoga pandemic. What’s so magnetic about Acroyoga? Not much, unless the idea of flying appeals to you and you’d like to end your session with a massage. Best of all, Acroyoga lets you revisit childhood memories of playing airplane on the family room rug with Mom and Dad. 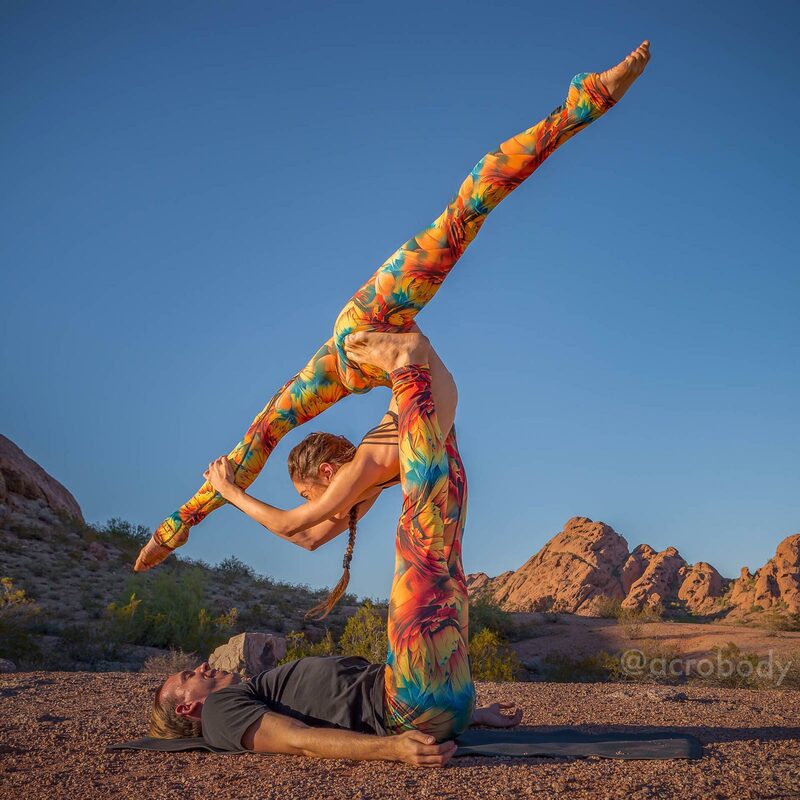 Don’t let the Acroyoga couple poses you’ve seen scare you; we’ve all seen those Instagram pictures. Those Amazing Feats of Yoga spreads starring beautiful people holding their bodies bent like pretzels for breath after gorgeous breath. Double-filtered, double-posed, one sturdily supports the other who glides effortlessly through the air like an unusually well-dressed hood ornament. These photos aren’t merely aspirational yoga—they are impossible yoga! What if I told you the body doubled poses of Acroyoga are far simpler than they appear? Impossible? Hardly. When Acroyoga appeared on the scene (sometime in the late 1990s or early 2000s, there’s some controversy about the exact details), people hungered for a social, inclusive, exciting version of yoga that fostered partnership in groups. According to AcroYoga International, Acroyoga “tap[s] into new and infinite possibilities of communication, trust, and union.” An Acroyoga pose involves the “base” partner posing supine, serving as a stable support for his/her “flyer” partner, whom he or she lifts from the ground by establishing and maintaining contact with several key areas of the body. A third participant, the “spotter,” observes, offers recommendations and adjustments when necessary. These two-person poses are accomplished with relative ease because they harness the strength of two bodies and focus them on achieving the same goal. The philosophy of Acroyoga echoes the Biblical paradigm of two people accomplishing more than twice as much than one person working alone. Three are even better, and this accounts for the spotter. Fans of Acroyoga applaud its fitness benefits and its transformation of yoga’s mind-body experience into a group experience. Traditional yoga practices the mind-body connection at an individual level, but because Acroyogis share both space and experience, their practice demands excellent communication. Though touted as a beneficial practice for romantic couples, Acroyoga’s innovation lies in fostering better communication among groups of non-intimate pairs because it allows them to build valuable life skills immediately. You must communicate precisely what you need to your partner, or else come crashing to the floor. Acroyoga is a more dynamic and social practice, and it is accessible to a wide population and appropriate to all skill levels. Imagine the people you’ll impress with all your new poses on Instagram. What are you waiting for? New classes and festivals are popping up everywhere. Check acroyoga.org for more information on classes near you.